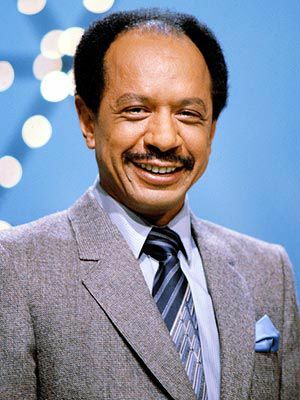 Sherman Hemsley, who played George Jefferson on The Jeffersons, has died at 74, according to police. The actor, who first played the role of Jefferson in All in the Family, also played Deacon Ernest Frye on TV's Amen. Hemsley died at his home in El Paso, Texas, police say. Born in South Philadelphia, Hemsley dropped out of high school to join the Air Force. He returned to Philadelphia and worked for the U.S. Postal Service, while taking acting classes at night. After performing with local groups in Philadelphia, Hemsley moved to New York to make his Broadway debut as Gitlow in Purlie. While touring with the production, television writer and producer Norman Lear contacted Hemsley to play the role of Jefferson on his new sitcom, All in the Family. Hemsley hesitated to accept but Lear held the role open for him and two years later, Hemsley joined the cast. Less than two years after Hemsley made his television debut, he and All in the Family costar Isabel Sanford were given their own spin-off in The Jeffersons. The series earned Hemsley Emmy and Golden Globe nominations in 1984 and 1985 respectively. In 1986, Hemsley was cast as Deacon Ernest Frye in the NBC series, Amen. The role would last five seasons, ending in 1991. He was also a professional singer and released a single on Sutra Record called "Ain't That a Kick in the Head" in 1989. In 1992, he released Dance, an R&B album. Although he retired from television acting, Hemsley joined Sanford through the late '90s and early 2000's to reprise their roles as George and Louise "Weezy" Jefferson on guest spots. The duo appeared on The Fresh Prince of Bel-Air and in commercials for Old Navy, Gap and Denny's. What a great individual who helped illustrate that within each and everyone of us exists a one an only inner ecology of the spirit. He helped weed out hatred and sowed the seeds of peace and respect.